Francis Skeffington met Hanna Sheehy in University College Dublin and they married in June 1903. In a gesture of equality they took each other’s names. Hanna had already founded the Women Graduates Association in 1901. After graduation, Francis worked as a free­lance journalist and Hanna became a school teacher. 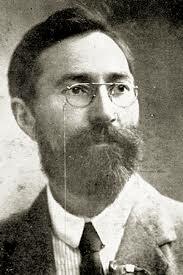 The Sheehy­ Skeffingtons joined the Irish Women’s Suffrage and Local Government Association. They also supported the Women’s Social and Political Union which lobbied for women’s rights in Britain. They were co­founders in 1908 of the Irish Women’s Franchise League and regularly addressed meetings in the Phoenix Park. Both Hanna and Francis were vociferous proponents of rights for women and Francis was a committed pacifist. 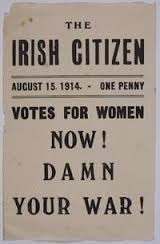 In 1912 they founded the influential paper the Irish Citizen, aiming to promote the rights and responsibilities of citizenship for both sexes, contributing many articles in support of women’s right to vote. Hanna was also a founder member of the Irish Women’s Workers’ Union, formed in 1911. 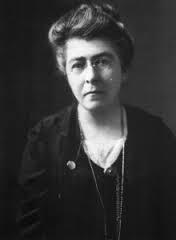 She was imprisoned for five days in 1912 for breaking several window panes of the War Office in protest at the exclusion of women from the franchise in the Third Home Rule Bill. Francis was imprisoned in 1915 for making anti ­recruitment speeches and went on a hunger and thirst strike until released. They were both active during the 1913 Dublin Lock Out, giving practical and moral support to the strikers and were involved in attempts to send strikers’ children to foster families in Liverpool. Francis became vice­chair of the Irish Citizens Army when it was established in 1913 on the understanding that it would have a defensive role. He resigned when it became a military entity. During the 1916 Rising he attempted to organise a civilian defence force to prevent looting. He was arrested by members of the British army and was held as an enemy sympathizer. He was shot the following morning and buried in the barracks yard at Portobello. He was re­interred on 8 May 1916 in Glasnevin cemetery. Hanna continued to be active. In January 1918, on behalf of Cumann na mBan, she personally presented Ireland’s claim for self ­determination to President Wilson. Upon her return to Ireland she was arrested and imprisoned together with Kathleen Clarke, Countess Markievicz and Maud Gonne­MacBride in Holloway Gaol, London. They were released after a hunger strike. Hanna supported the Republican side in the Civil War as a member of the Women’s Prisoners’ Defence League. In 1930 she toured Russia prior to becoming editor of the Republican File, a republican ­socialist journal, and subsequently became assistant editor of An Phoblacht, the organ of the Irish Republican Army. She was jailed yet again for demanding the release of republican prisoners and protesting against partition at a public meeting in Newry, Co. Down. Hanna strongly opposed the place of women in de Valera’s Constitution of 1937 and became a founder of the Women’s Social and Progressive League, a party which came into being after a mass protest of women at the Mansion House, Dublin. It failed to win significant support although it campaigned strongly in the 1938 general election. In 1943, at the age of sixty ­six, she stood as an independent candidate in the general elections, demanding equality for women. None of the four feminist candidates received any support from the electorate. She died in Dublin in April 1946 and was buried in Glasnevin cemetery.